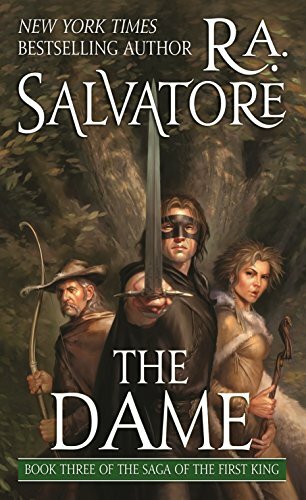 In The Dame, the third volume in R.A. Salvatore's Saga of the First King series, Bransen's road becomes a quest for the truth, of Honce and of himself, a quest to put right over wrong. That path is fraught with confusion and fraud, and a purposeful blurring of morality by those who would seek to use the Highwayman's extraordinary battle skills and popularity among the commonfolk for their own nefarious ends. Bransen Garibond, the Highwayman, held little real interest in that fight. To him the warring lairds were two sides of the same coin. Whichever side won, the outcome for the people of Honce would be the same, Bransen believed. A journey north, however, taught Bransen that his views were simplistic at best, and that some things--like honor and true friendship--might truly matter.